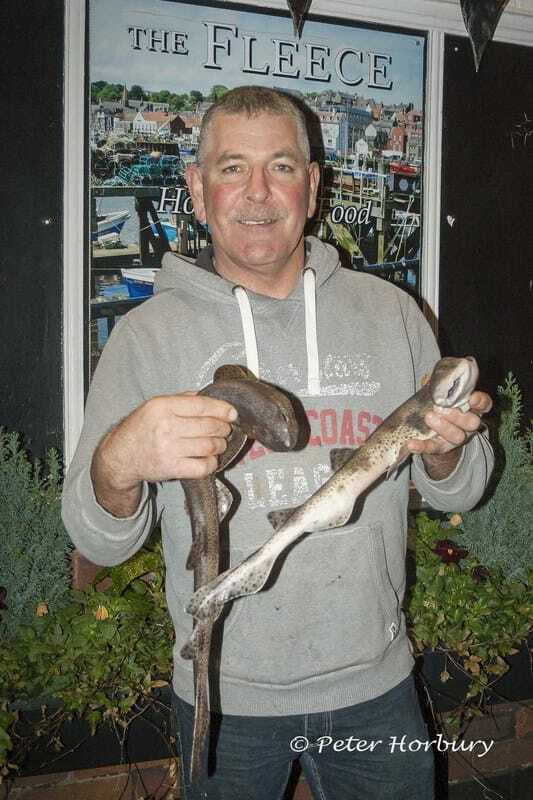 It is always nice to catch a fish and even better if one can prepare it for the table. 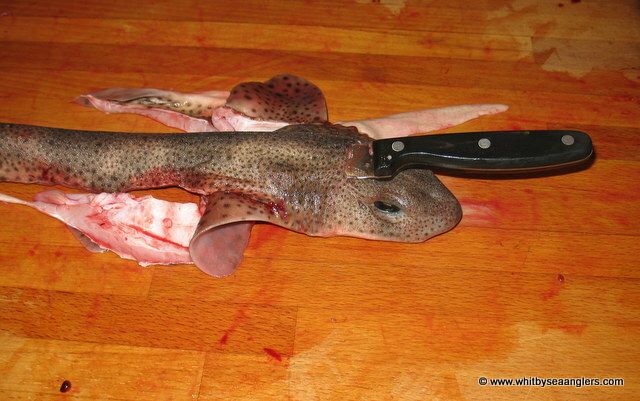 Having been asked numerous times how I prepare a dogfish for cooking I decided it may be useful to demonstrate my technic using the pictures below. 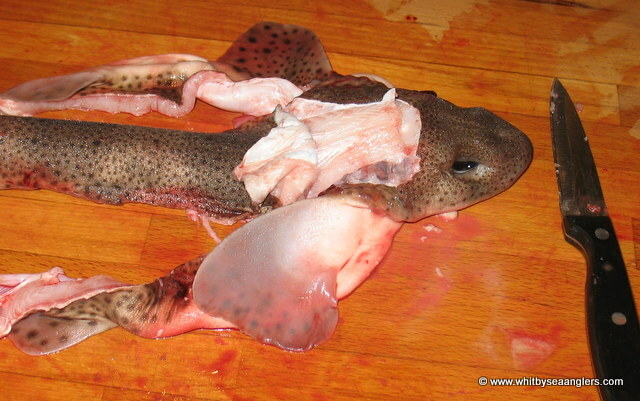 A dogfish needs to be skinned, I keep them (gutted) in a fridge overnight, skin and trim the next day. Warning - It is a little messy with plenty of blood. A sharp knife is a must, as the skin resembles coarse sand paper, is as tough as leather and can cause abrasions. 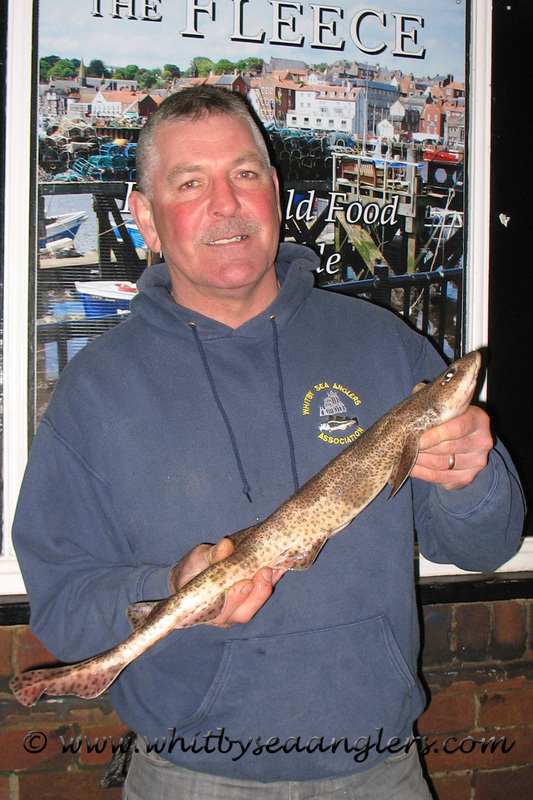 Gloves are also recommended as will numerous re-sharpenings of the knife on a steel if doing more than one dogfish. If you have caught one they tend to wrap themselves around your wrist and can take your skin off. Remove the tail and 3 dorsal fins - 2 on top and 1 underside. 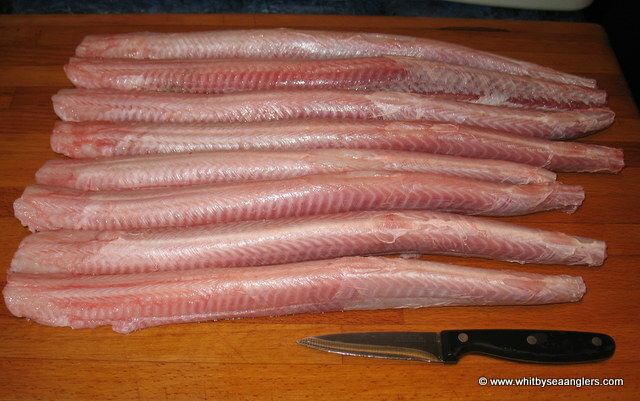 It is important to cut through the skin on the underside which gives a free edge when pulling the skin off. Cut away the sides of the abdomen right up to the back of the gills. Once both sides are done flip over the right way up so as to start preparing for removal of the skin. A flap of skin is required with which to hold onto, do not remove the head until later. 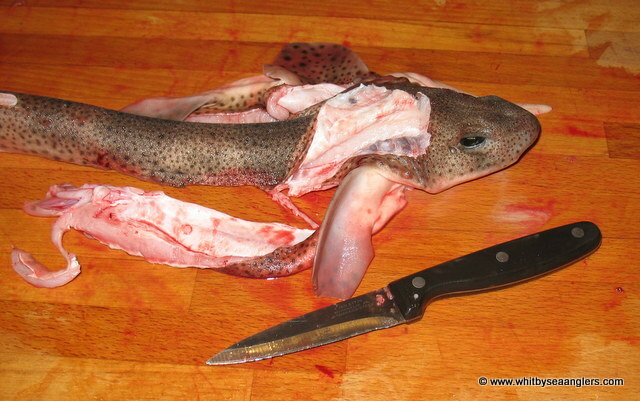 Carefully slide the knife directly under the skin and make a cut to join up with the abdomen cut made earlier (below). You now have a tag of skin big enough to grab hold of with thumb and forefinger. Remember to wear gloves or use a rag to protect your skin. Holding the head in one hand take a firm hold of the flap of skin at the back of the head and pull down laterally slowly with an even force keeping the pulling hand low so the fish remains on the board. 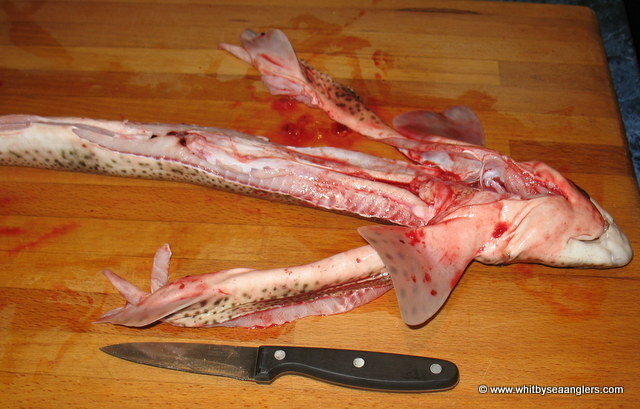 The skin should come off in one piece if you have remembered to cut the underside. Cut off the head and you have all the edible flesh which may require a little trimming. Dressed, washed and ready for cooking. The skeleton is cartilaginous - having a skeleton consisting mainly of cartilage which is a bonus - no bones. Hope you found this useful & enjoy.